Murphy’s law struck. Everything was going well for the meal I was making for friends. Then my oven stopped working. It was the Victoria Day long weekend here in Canada. 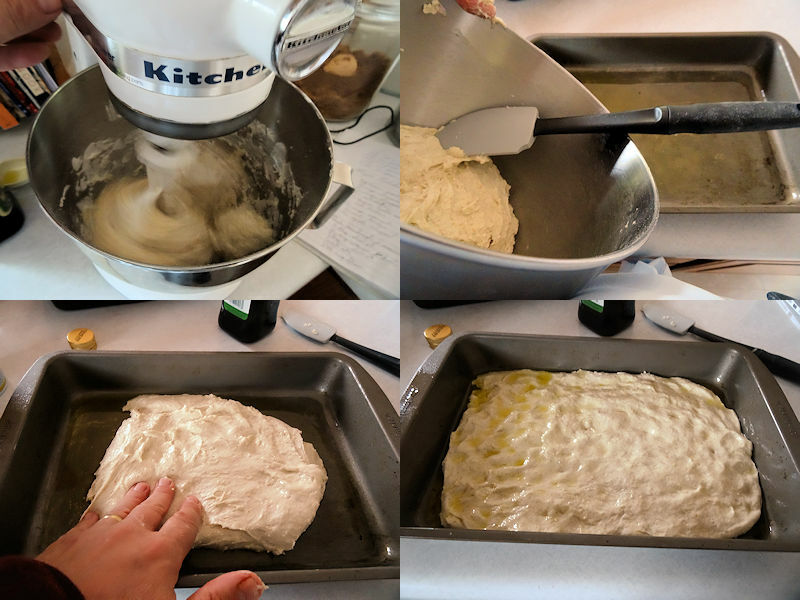 Fortunately, the Louisiana Grills Pellet Smoker has good temperature control and I was able to make the Easy Focaccia I was planning on serving in the smoker. 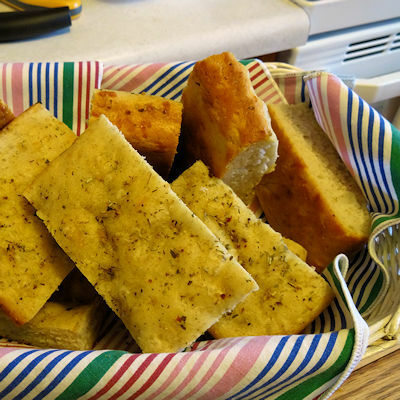 Why make an easy Focaccia? Well, I was already doing the Berbere Pork Loin and had other chores so I wanted something tasty but not taking up a lot of my time. This recipe has a rising time but doesn’t take up a lot of the cook’s time. I started by spraying a pan with baking spray and then putting 25 ml (2 tablespoons) olive oil in it. I put the warm water, 40 ml (3 tablespoons) olive oil, salt, flour, fast rise yeast, sourdough starter and Parmesan cheese in the bowl of my stand mixer. I put the mixing paddle in and turned it on medium for 1 minute 30 seconds. This should form a soft dough. Turn the dough into the pan and grease your fingers. Press the dough out to the edges of the pan. If it keeps shrinking back, let it sit for 10 minutes and press again. Some of the olive oil in the pan will come up around the edges, don’t worry about it. Cover the pan with a towel and let the bread rise in a warm place for about 90 minutes, until the dough is puffy. Preheat your oven or smoker to 375 F at the end of the rising time. Sprinkle some olive oil on the surface and sprinkle Italian seasoning blend on the surface. If cooking in a smoker, turn another pan upside down and put the focaccia on it. If cooking in the oven, put it on the middle rack. Cook for 25 to 30 minutes. I use an instant read thermometer. When the internal temperature is 200 F, the focaccia is done. Let the focaccia cool in the pan for 15 minutes. Cut it into 8 pieces. 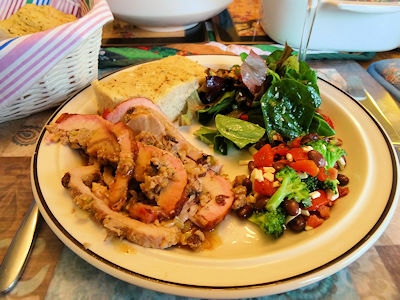 We served it as a side dish with Berbere Pork Loin and two delicious salads by She Who Must Be Obeyed. This is an excellent focaccia. It doesn’t have as chewy a texture as one that is kneaded and allowed to rise over time but it is moist and spongy with a great flavour. The real test is that the guests had seconds of it, something that a cook always likes to see. 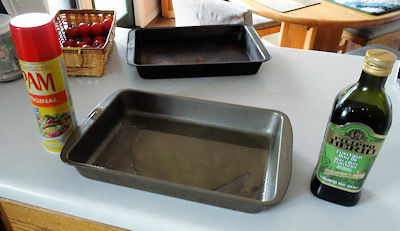 Spray a 9 by 13 inch pan with baking spray. Spread 25 ml (2 tablespoons) olive oil around bottom of pan. Put water, 40 ml (3 tablespoons) olive oil, salt, flour, yeast, sourdough starter and cheese in the bowl of a stand mixer. Attach the mixing paddle and mix for 1 1/2 minutes at high speed to make a soft dough. Turn the dough into the pan. Grease your fingers and press the dough to the edges of the pan. If it keeps shrinking back, let it sit 10 minutes. Some oil will push up around the edges. Cover the dough with a towel and let it rise for 60 to 90 minutes, until puffy. Near the end of the rising time, preheat your smoker or oven to 375 F.
Spread any olive oil that came up around the edges over the dough or sprinkle with olive oil. Sprinkle the Italian seasoning over the focaccia. If cooking in a smoker, put another pan upside down in the smoker and put the pan with the focaccia in it on top. If cooking in an oven, put it on the middle rack. Cook 25 to 30 minutes to an internal temperature of 200 F.
Let cool for 15 minutes in the pan. That looks yummy and thank goodness for the smoker! I am not sure I’d make it long without my oven! I tried a focaccia with my starter (thanks again for the inspiration by the way, I have been loving playing with it!) and it was okay but not great. I’ll have to try this recipe next. Glad you are enjoying the sourdough.